Yes, after all these years writing about attempts to raise brave, adventurous and healthy kids I have a confession: My 7-year-old is currently and frequently too busy to eat. I had to call an emergency plan to make sure he's getting enough fuel for his daily jumping and running. I am sure his calorie expenditure is high: When not sitting in the classroom, the boy is, most of the time, in action, and seems to have endless energy. What I am also sure of is that some days he is extremely distracted, not interested in food of any color or shape, and his lunchbox comes home still full of food from the school. For those days, when he is not in the mood to eat his whole bowl of cereal, drink his milk, eat the recommended fruit portion for his age, and "no way Mom" he's not going to eat almonds, I just use my new Waring blender and pack as much nutrition in a cup as I can. After testing some ready-made shakes to help with kids who don't want to eat, I made our own. It's not gourmet, and far from trendy, but it works. It seems like after drinking the cereal drink in the morning, his day goes smoother, and he's less cranky and has more appetite. Cheers! I am still testing other mixes that may include almond butter or peanut butter. Mix all ingredients in a blender on high speed until smooth and mixed well, and serve immediately in an attractive tall cup. It’s almost time to plant garlic! Even if you aren’t much of a gardener — even if you don’t have a garden — you should stick some garlic cloves in dirt. It takes almost no effort and the potential rewards are gratifying. To me, it’s a meditative pleasure to begin so many meals with aromatic garlic grown just steps away from my kitchen. Even if dinner is just spaghetti tossed with garlic and olive oil, that homegrown garlic makes it mine. Growing garlic is simple and satisfying for kids too: Those bulbs under the ground are a promise of spring’s bounty. Tuck some cloves into the ground this fall and by next summer you'll be cooking with your own freshly harvested garlic. Enjoy the spring garlic and scapes, but be sure to leave plenty to harvest later so you can enjoy them well into winter. Like most things, there's an easy way and a hard way. 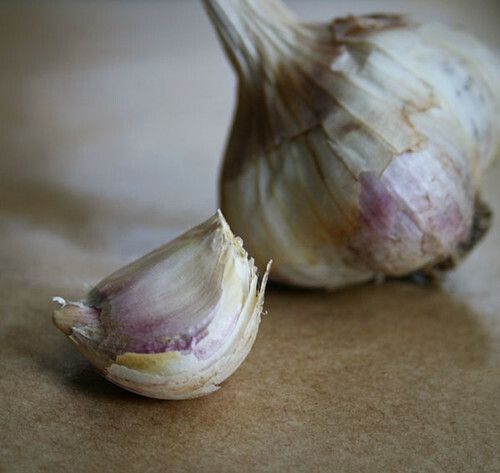 The easiest way: Separate some nice, big cloves from an ordinary garlic bulb from your market. Poke them an inch or two into the ground, pointy end up, and keep them 4 to 6 inches apart. Cover with some mulch, such as fall leaves, and ignore until spring. If you’re really fussy, you can inoculate the cloves before planting and fertilize in the spring ... I don’t bother. They seem to do fine in their own, even in the heavy clay soil here. In early summer I watch for leaves turning brown. When just a few green leaves are left, I gently dig the bulbs out of the dirt, carefully shake off as much soil as I can, and set them on newspaper in a single layer, out of the sun, so they can cure for storage. After a few days, you might want to brush more dirt off the drying bulbs. Be careful not to bruise them. I was overly aggressive last year and damaged quite a few, so this year I skipped this extra cleaning. My bulbs look a little grubby, but they taste great. I aim for planting my garlic the first two weeks of October or so, but you should check advice specific to your part of the world. For more detailed guidance, try these simple tips from the Daily Green. 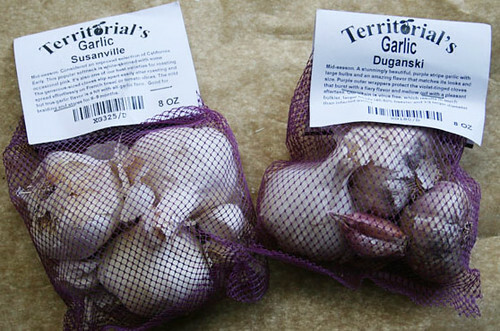 Apartment Therapy offers a primer on growing garlic in a container. If you want to order bulbs for planting, do it now! I like Territorial Seed Company (I ordered their softneck/hardneck combo) and John Scheepers Kitchen Garden Seeds. We are sharing this family recipe to celebrate the arrival of the Jewish New Year, thanks to my mother-in-law. She bakes this honey cake not only for the party, but also to renew thoughts and sentiments. Preparing and baking the cake is such a unique time for her, that she once wrote a poem about it called Honey Cake. 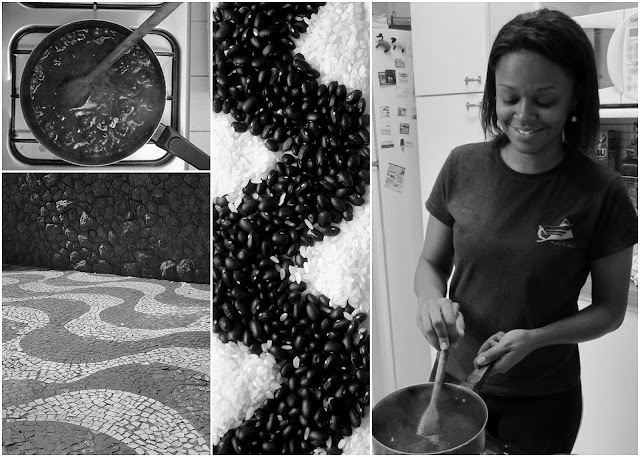 The recipe was published in the late '70s in Aonde Vamos, a magazine edited by her mother-in-law, Mrs. Esther, in Brazil. Since then, Myrna has been improving it, and it has always been a success in the family and a treasured gift to be given to her friends. Myrna fondly recalls the memories form her grandma, Mme. Schaak, who used to love the cake: "She would keep it in a tin and would eat it even one month after! Grandma used to say that the cake just got better with time," she tells. Yesterday afternoon I prepared this cake with some help from the kids, and we brought the recipe to life with all its meanings. As I was putting together ingredients and measuring cups and spoons, I thought about the poem. I didn't have enough regular flour, so I ended up using part of whole wheat flour. But I was sure that it was going to work. As part of her poem said, it was time for a cake "flexible, balanced, made in a sensitive way with lots of taste and warm colors. "As the poem ends: "I shall fill it with love." And there it was. What a wonderful way of bringing generations of families together when baking and celebrating. Shanah Tovah! I used 2 1/2 cups of whole wheat flour, which gave the cake a bread-like texture. Also kids worked with a nuts chopper and helped to pour the honey. We mixed all wet ingredients separately, integrating them into the dry ingredients with a spatula. Baking time was reduced to 60 minutes, when the crust was already very browned, maybe because of the flour difference. What a fantastic recipe! To prepare the walnuts, break them inside a plastic bag, pounding them with a meat mallet. Preheat oven to 350 F. Combine all ingredients in a bowl and mix in a stand mixer up until it's all well mixed. Bake in a two metal or ceramic loaf molds for around 70 minutes. Sweet, colorful peppers have been a bargain lately at my local market, available for a fraction of their usual price. I scooped up a bunch and, with just a bit of work one evening, had myself a nice stash of roasted and marinated peppers. They're ridiculously easy to make, and when you get fresh peppers for a good price it's more than worth the minimal effort to prepare them yourself. You can use your roasted peppers right away, put some up in the freezer, or make your own custom jar of marinated bliss. Roasted peppers are a surefire way to jazz up almost any savory dish: toss some with pasta, add them to a frittata, put them on pizza, layer them on a sandwich, purée them into a dip, enjoy them as antipasti, sprinkle some into steamed veggies, serve them with simply cooked meats ... They're a delicious and versatile accompaniment. If you have little ones who don't mind handling slippery foods, enlist their help slipping the charred skins of the cooled peppers. Preheat broiler with the rack near the top of the oven. Oil a baking sheet, or cover the sheet with foil for easier cleanup. Wash and dry your peppers and set them in a single layer on the prepared baking pan, leaving a little space between them. Broil peppers, making sure they're just a few inches from the top. Check them every few minutes, using tongs to turn the peppers as their skins char and blacken — in my oven, it takes about 20 minutes. 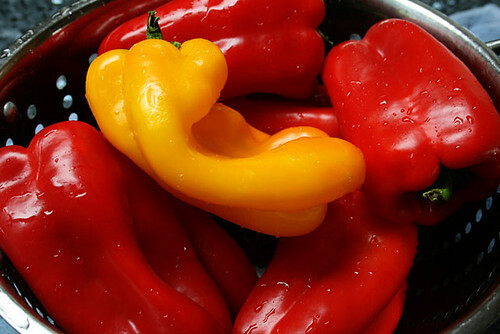 When peppers are cool enough to handle, peel them over a bowl to collect the deep, rich juices. Use a knife to scrape away the stem, seeds, and membranes. Discard these and the blistered peel. 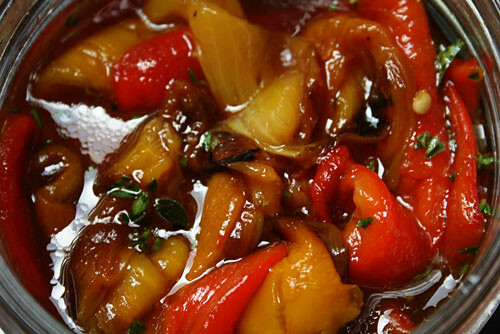 To store for a few days: Refrigerate the peppers in their juices and a little olive oil for a couple of days. To freeze: Wrap portions of peppers in wax paper. Set packets on a plate or tray and put in the freezer for a few hours, then store individually frozen packets in a bag in the freezer. 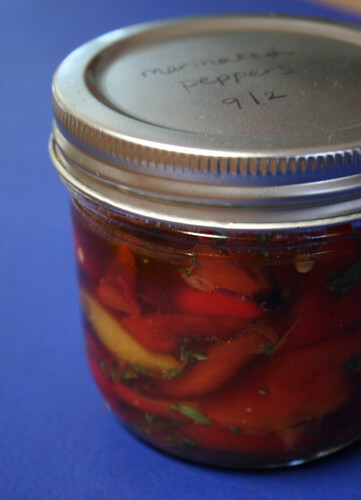 For marinated peppers: Put peppers and juices in a jar. Add lemon juice or vinegar, olive oil, and fresh herbs such as thyme, basil, or oregano, plus salt and pepper. Garlic cloves, capers, olives, and mozzarella cubes are all terrific additions. The jar should keep about two weeks. 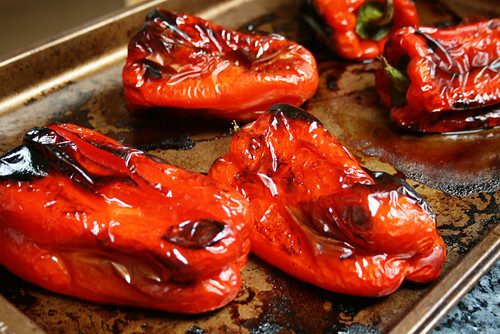 For fire-roasted peppers: Hold peppers — with tongs! — over a gas flame or toss them on the grill until charred, then put in bowl and follow the rest of the directions. My 7 years old had already two years in a row of Cooking Club, which had been really fun, as some of the recipes were first tested with Darienne and her boys. My now 5 year old under, though, is going to have his first year of cooking classes, and can't wait to start. It looks like Cook Play Explore is going again to be full powered for Fall! We can't wait! Portable electric equipment is always a good choice to use if you're working in a classroom or even your dining table. Griddle, ice cream machine, pasta machine, crockpot and hand blender are some that I've used for from scratch recipes and worked just perfectly. If baking is the plan, and you have access to a oven- think always about mini-muffins and mini all things to reduce baking time, and, therefore, anxiety from the kids. Safety is, obviously, a big concern. Practice had taught me that serrated plastic knives from party-ware packages are very useful and good to cut strawberries, bananas and other types of fruit and vegetables. Very clean children sized scissors are also a good idea. Always work close to the teachers to find out about any allergy in the classroom. Try to adapt recipes to avoid frustration, but if not possible, have the parents of the kid with allergies to send some alternative ingredients or snack so not for him to be excluded. Delicious raw candies that took some prep before the activity and was inspired by the awesome I'd like to Eat a Child book. Two electric griddles made this possible. Kids had lots of fun cutting vegetables and savoring the wonderful rice. 24 new scissors were donated to make the activity possible and clean. A portable mini oven was used to make the croutons, and peer pressure made some kids to eat lettuce for the first time. This was a delicious treat enjoyed by kids and teachers with fruits on the top. Icre cream machines made it possible! The old revisited folk tale inspired this recipe which had a bit f a different stone in the soup. Enjoy, and, of course, never forget to invite the little chefs to wash their hands with soap and water before every cooking session. Have fun!